The issue opens with Batman chasing down two thugs through Gotham Central Station. After some amazing Batarang throws, Batman captures both men and demands they turn over a poison. Batman delivers the poison to Commissioner Gordon. Diego Rivera, a champion of ecology, has been poisoned. Gabriel Molinos of the South America Economic Council is demanding the GCPD solve this heinous crime. 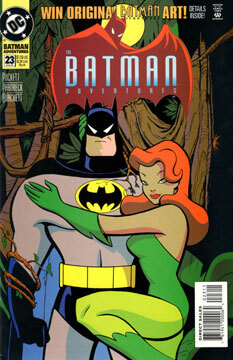 Batman knows the poison is rare, plant-based, and without an antidote, so he turns the Gotham’s resident poison expert, Poison Ivy. After some convincing, he takes Ivy to the lab he’s prepared. Ivy knows of Rivera, and starts to take a greater interest in saving his life. In time, Ivy creates an antidote. At that moment, Rivera speaks. Batman is unaware the antidote is ready. Moments later, the lab is attacked by armed goons! Batman takes them all down. Meanwhile, Ivy administers the antidote to Rivera, and then slips away. The last goon to be taken down is Molinos, who orchestrated Rivera’s poisoning all along. He feared Rivera’s protection of the natural habitat would hamper their country’s economy. The story ends with Ivy finding the mysterious flower from which the poison was made. This issue is another favorite of mine. The script is strong. It plays with Batman’s relationship to a major villain, and features strong visual storytelling. This is another I’d love to see animated. A great deal of this issue’s high quality has to do with Parobeck’s “silent” story telling. Whole pages pass without text, but there’s plenty going on, and it’s all crystal clear. The man was a master. Ivy appears in the always changing Arkham prisoner garb, but not much else.